Jacksonville win leaves Tampa the only winless team in the NFL this season. 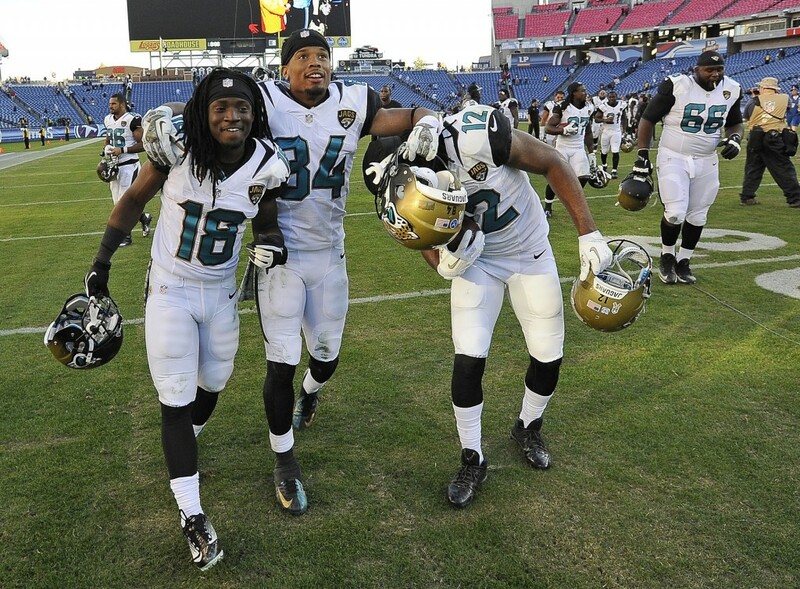 NASHVILLE, Tenn. — It’s game balls all around for the Jacksonville Jaguars, winless no more. They can thank the Tennessee Titans for helping them finally get that first victory this season. Owner Shad Khan gave first-year coach Gus Bradley a game ball, and the coach made sure both his boss and general manager David Caldwell each got one, too, after the Jaguars held off the Titans 29-27 Sunday. All the Jaguars will be receiving a game ball to remember this very big win. Maurice Jones-Drew and Jordan Todman each ran for a touchdown as the Jaguars left Tampa Bay at 0-8 as the only winless team left. The Buccaneers host Miami on Monday night. The Jaguars (1-8) scored the most points in a game this season. They never trailed and forced four turnovers they turned into 17 points. On a day the Titans (4-5) held a moment of silence for late owner Bud Adams, they got caught looking ahead to Thursday night’s AFC South game with division leader Indianapolis. The Titans also lost Jake Locker to an injured right foot that had him on crutches and in a walking boot in the second half. The Titans were coming off an emotional win over former coach Jeff Fisher in St. Louis, and they looked flat from the start — when even Adams’ family was late to the stadium and a news conference introducing the owners was scratched before kickoff. “We had a lot of things happen today that should never happen to us in any game,” coach Mike Munchak said. The Jaguars took advantage despite being outgained 362-214 in total offense. Henne threw for 180 yards. Outscored 70-15 in the first quarter of the first eight games combined, the Jaguars jumped to a 13-0 lead with Paul Posluszny stripping Chris Johnson of his first fumble this season on Tennessee’s first offensive play, and Dwayne Gratz intercepting a Locker pass. The first turnover set up Jones-Drew for three straight carries capped by a 6-yard TD run. Josh Scobee kicked his second field goal, a 44-yarder, after the interception, giving the Jaguars’ their biggest lead in any game this season, 13-0 early in the second quarter. The Jaguars could have had a bigger lead if not for a shotgun snap bouncing off receiver Ace Sanders as he ran in motion. Not even Munchak seemed ready. The Titans coach wanted to challenge a 22-yard sideline catch by Cecil Shorts III, but threw the flag as the Jaguars snapped the ball. Munchak said later he was waiting for a better replay before deciding to challenge. Locker hurt his right foot in the second quarter at the end of an option keeper. He was so hobbled he couldn’t connect with Johnson on a handoff on the next play, and the Jaguars recovered with 6:22 left. Locker was on crutches after the game and said he will have more tests Monday. “I was tired of having to come off the field because I was hurt,” Locker said. Fitzpatrick replaced Locker, and he threw for 264 yards and two touchdowns. He also ran for a 4-yard TD with 4:15 left trying to rally the Titans. But after the Titans forced the Jaguars to go three and out, Fitzpatrick was sacked by cornerback Will Blackmon, who stripped him of the ball and ran it back 21 yards for a 29-20 lead. The Jaguars also held the Titans to a pair of field goals by Rob Bironas in the second half. Bryan Anger pinned the Titans at their 1 with a 42-yard punt, and the Jaguars got a safety when rookie right guard Chance Warmack was called for holding Sen’Derrick Marks in the end zone. That safety with 7:44 left was the winning margin. “It’s something we can build off of,” Marks said. NOTES: The Jaguars now have won four of the past six in this series. … Jaguars receiver Stephen Burton suffered a head injury in the fourth quarter. … The Jaguars had been outscored by an average 22.3 points through the first eight games. … Johnson passed Earl Campbell for second all-time behind only Eddie George for most yards from scrimmage in franchise history.